What to do around news events or when the market starts to move strongly caused by some news that just hit the market? I’m sure this is one of the most common questions traders ask themselves every day. At least I do! If you’re new to trading and actually take this as a serious business, not just another place to gamble here’s my answer: Don’t trade shortly before or after news releases and come back when the market is back to normal. The odds of getting into trouble are much higher than making a profit if you don’t know what you’re doing. On the other side if you’re an experienced trader you might have recognized that it’s not all black and white when it comes to trading news. Yes, volatility can get crazy, liquidity can be worse than usual and often you’ll just get stopped out of trades before the market takes off. But often this is also the time when the market does make major moves and to survive as traders it’s helpful if you can capture some of these. That’s especially true in news driven markets like the currency markets. - Get into trades only with limit orders, the odds of getting negative slippage are too high using market orders. Using limit orders chances aren’t bad you’ll get positive slippage on a regular basis. - Cancel any orders that are close to where the market is trading before the news. Odds are they’ll get filled simply due to the volatility in the market. - Fade the move at support/resistance points where the market might be too stretched to move through on the first attempt. Moving to a lower timeframe to look for reversal patterns can be helpful if you don’t like blindly fading a strong move. - Use small stops and multiple R targets. This will only work if you capture > 3R winners on a regular basis. Many of these trades will not work out and often you’ll have to take a full loss. - To achieve this, don’t scale out. You don’t want to hit that 5R profit target with only 1/3 of your position on! Instead, trail your stop and tail it tighter the more parabolic the move gets. - Have a far-off profit target in place in case the market goes crazy enough to make it there. 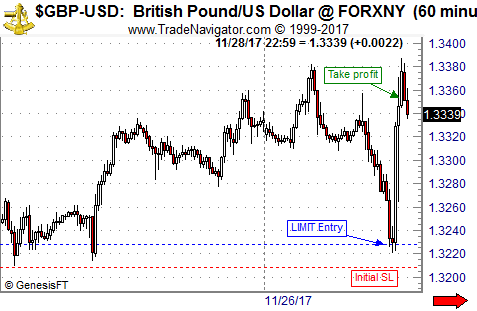 Here’s an example from this Monday of such a trade in GBP/USD. It’s a very nice example and most trades don’t turn out that nicely but showing a losing trade that just stopped me out would be boring right? I had planned to buy around 1.3290 but as the news hit the board I canceled the order. But just in case the market would go there I put in a new entry order at a much lower price (see chart). I got filled there when the pound really was sold off and about 2 hours later the market unexpectedly hit my profit target. While the pound was moving higher I kept on moving up my stop but luckily didn’t get stopped out before the target was hit. I Always Watch the US Dollar, Do You? How do bankers trade forex? What is the Net Investment Income Tax (NIIT)? Are You Focused on Real World Thinking?